John Elliott just presented his latest Spring/Summer 19 collection entitled "Los Angeles," which not only identifies with the styling for the show but also a further ongoing partnership with The City of Los Angeles which he announced just 3 days prior to the show. 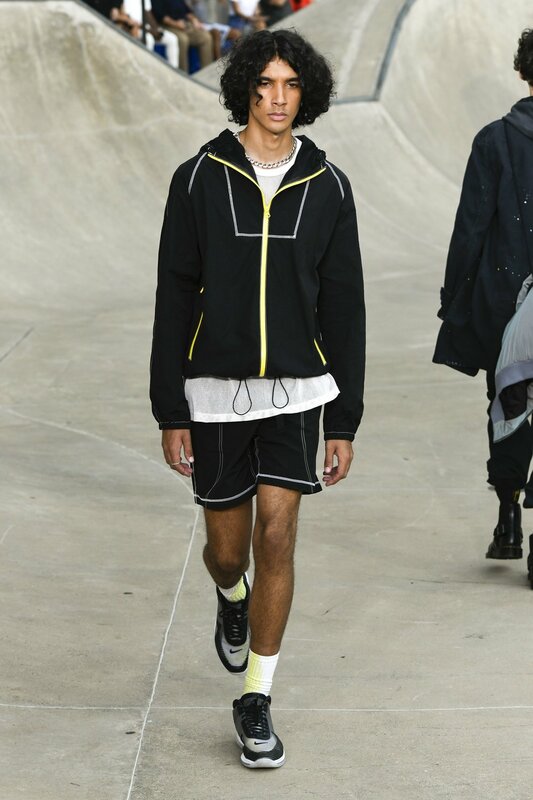 Presenting his latest collection at the Chelsea skatepark, John Elliott really brought out the celebrity star power considering New York's weakening fashion week stature. The likes of Hailey Baldwin, Justin Bieber, Ben Simmons, and LeBron James were all in attendance to see the latest offering from JE. This season built upon some of the collaborations John Elliott has been so successful with such as Suicoke & Nike. Coming out with new colorways of his popular Suicoke sandals as well as furthering his Nike footwear options was a great way to start the S/S 19 collection. In addition to the exciting footwear throughout the show, there was a great use of florals prints, earth tones, and tie-dye pieces which all speak to the Los Angeles identity. Sheck Wes also made his second runway appearance rocking a yellow and cream floral shirt with a slim cut denim and a new variation of the Suicoke collaborative sandals, which was my favorite look of the entire show. Be sure to swipe through all of the runways looks below.